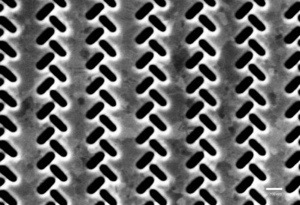 An electron micrograph shows the nanoscale perforations at the surface of the plasmonic coupler. Credit: Jiao Lin and Balthasar Müller. (Phys.org) —A Harvard-led team of researchers has created a new type of nanoscale device that converts an optical signal into waves that travel along a metal surface. Significantly, the device can recognize specific kinds of polarized light and accordingly send the signal in one direction or another. This entry was posted in Manufacturing Technology, materials, Science, Tech and tagged meta materials, Optics, plasmon switching by Sci Fi Engineer. Bookmark the permalink.